Cathay Pacific has donated Boeing’s very first 777 to the Museum Of Flight in Seattle where she will sit beside the first 737, 747 and Concorde. The aircraft prototype (N7771) was purchased by the airline in 2000 after being converted to to a production version 777-267. 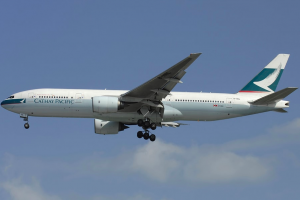 Whilst in Cathay Pacific colours she bore the registration B-HNL The aircraft made history on the 12th of June, 1994 when she took off from Boeing’s Seattle Field.